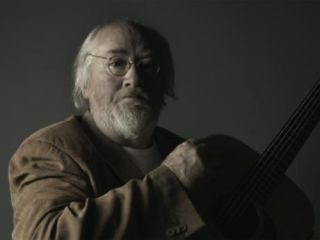 Musikmesse 2011 Press Release: One of the world's most brilliant fingerstyle guitarists, John Renbourn has dazzled, confounded and inspired, whether solo, paired with Bert Jansch or Stefan Grossman or as a member of Pentangle, and he continues to create music of uncommon beauty and depth. Joining forces with C. F. Martin & Co. - which originated the orchestra model in 1929 - to create the Martin OMM John Renbourn Custom Artist Edition is the natural culmination of a lifelong quest. "I am over the moon about this guitar," Renbourn commented. "The goal is to combine the best of American and European lutherie: a guitar that has design features that recall the European influence on early Martins, but with all the innovative qualities that Martin has developed since. My own priority is simple - I am after the very best tonal quality and balance." On both objectives, the Martin OMM John Renbourn Custom Artist Edition succeeds spectacularly. This beauty begins with a classic Martin design and exceptional solid premium tonewoods. Martin's OM design, with its 15" body and long (25.4") scale, is the ultimate fingerstyle guitar; revered for its balance and projection. The back and sides are rare Madagascar rosewood, similar in appearance and sound to the now-endangered Brazilian rosewood. The top is Italian alpine spruce, prized for its clarity and dynamic range, and features 1/4" scalloped bracing for exceptional responsiveness. The neck is carved from genuine mahogany. While the neck's 1 3/4" width at the nut - with a low profile shape for playing comfort - is an original Martin OM design element, the diamond volute and slotted headstock with square slots are reminiscent of guitars from the late 19th and early 20th century. The tuners are like-wise vintage inspired: Golden Age nickel tuners with ivoroid buttons and engraved plates. In contrast, the ebony headplate and fingerboard show- case Martin inlay artistry at its best. The polished headstock features a richly detailed unicorn inlay in abalone pearl, gold and white mother of pearl, and Micarta. The finger- board provides the "canvas" for unique mother of pearl pentangle (five-pointed star) position markers at the third, fifth (2), seventh, ninth, twelfth (2), fifteenth and seventeen frets. Additional vintage-inspired features complete the Martin OMM John Renbourn Custom Artist Edition. The ebony pyramid bridge is fitted with plain ebony bridge pins; the endpin likewise is plain ebony. Fine herringbone purfling and delicate black/white line purfling encircle the top and back, respectively, each protected by grained ivoroid binding. The endpiece is also grained ivoroid, framed by fine black/white inlay. The nut and compensated saddle are crafted from genuine bone. True to fingerstyle - and early Martin - tradition, the guitar comes without a pickguard. Aging toner on the top adds to the vintage-style patina. The body showcases Martin's flawless polished gloss lacquer finish, while the neck receives a satin finish. Guitars may be ordered with a sunburst top and factory-installed electronics at additional cost; left-handed instruments can be ordered with no additional charge. Delivered in a Geib™-style hardshell case, each Martin OMM John Renbourn Custom Artist Edition guitar bears an interior label personally signed by John Renbourn and numbered in sequence. Authorised C. F. Martin & Co. dealers are accepting orders for the OMM John Renbourn Custom Artist Edition now and a list of participating dealers will be posted on the Martin website.